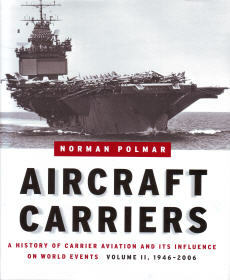 Aircraft Carriers is the definitive history of world aircraft carrier development and operations. The two-volume work describes the political and technological factors that influenced aircraft carrier design and construction, records their operations, and explains their impact on political-military events. 548 pgs w/index, HB w/dust jacket, 8.75 x 11.25, b&w photographs.